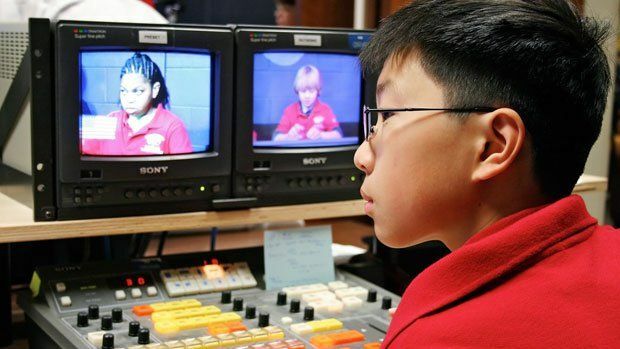 Fifth graders like Matthew write and produce an in-school news broadcast each morning. To challenge and support each child at his or her own level, the Forest Lake teachers and staff are deploying a powerful array of widely available digital-technology tools. Each classroom is equipped with an interactive whiteboard and a Tech Zone of eight Internet-enabled computers. Plus, teachers have access to gadgets including digital cameras, Flip cameras, remote-response clickers, and PDAs. More important than the gadgets themselves, of course, is how the teachers use them to create personalized lessons and a productive environment where each child is engaged. Here are Forest Lake teachers' top tips on how to do it. Why wait days or weeks to deliver and grade a quiz to find out which kids missed important concepts? Teachers here routinely use remote-response systems (clickers), colorful little gadgets that allow each child to enter her answer to a practice question so that the teacher can instantly see who got it right or wrong. Computer software programs, too, can give kids practice questions, quickly diagnose trouble spots, and allow teachers to customize subsequent lessons for each child's needs. Free up some hours for more creative, fun technology projects (and for yourself!) by using software to do much of the basic-skills practice and assessment that would otherwise take up a lot of time. Educational computer programs (Study Island and EducationCity are Forest Lake favorites) can identify specific weaknesses in a child's skills, such as understanding analogies or adding fractions. Teachers can review these outcomes daily, then assign lessons to each student according to her needs -- for the next time she logs on. Give a classroom of students an array of different, personalized tasks to do, and they'll inevitably finish them at different times. That's a tricky part of differentiation. Forest Lake teachers tackle this by assigning a weekly list of "must dos" and "may dos," so kids who finish first can always find something to do next. Before starting each unit of study, grade-level teams at Forest Lake brainstorm a way to assess prior knowledge so they can tailor the lessons effectively to each child. It can be as simple as a question that the class answers with a thumbs-up or thumbs-down or as rigorous as a one-on-one conversation. Computers don't always perform the way you wish or expect, especially if the teacher in command is new to digital technology. So as you embark on this journey, expect the unexpected. When obstacles arise, you can model good problem-solving behavior by asking students to help you devise alternative approaches. "I say to students, 'You know what? If something doesn't work, it's OK,'" Lowe explains. "Every experience is a learning experience." If you've got the tech tools, put them in kids' hands. In Lowe's class, students use Flip cameras to film each other doing oral book reports, then critique both the presentation and the videography. Other Forest Lake teachers routinely give kids turns at leading lessons on the whiteboard, either by hand or with remote tablets called AirLiners. These opportunities allow students to work at their own pace, capitalize on their skills, and discover ways to work around their challenges. To ease the burden of planning lessons for students at diverse levels, Forest Lake teachers often divide up this task. When they plan each unit of study, different members of each grade-level team design the activities for higher-skilled kids, lower-skilled kids, etc.